S (Scripture): 1 Samuel 17:38 Then Saul clothed David with his own fighting attire and put a bronze helmet on his head. He also put body armor on him. 39 David strapped on his sword over his fighting attire and tried to walk around, but he was not used to them. David said to Saul, “I can’t walk in these things, for I’m not used to them.” So David removed them. 40 He took his staff in his hand, picked out five smooth stones from the stream, placed them in the pouch of his shepherd’s bag, took his sling in hand, and approached the Philistine. O (Observation): David is sent to check in on his brothers and to see how the Israelite army is handling themselves against the Philistines. David shows up and sees Goliath mocking God and God’s army. He is moved to take action. He tells Saul God has called him into action. Saul agrees. The text above is Saul’s next action: to fit David into Saul’s gear. It doesn’t work. David puts the helmet and protective gear on, but it doesn’t fit David – he’s too small. And the helmet slides down and the sword is too cumbersome. Instead, David is protected by the Lord, and uses the gifts he’s been given: his shepherd’s staff, a sling and some smooth stones. He is confident that the Lord is watching over him. And yes, David kills Goliath with one slingshotted stone to the head. A (Application): Challenges in our lives cause us to second-guess ourselves. We look to the ways that others solve mysteries, tackle a project, or handle tough situations, and we try to emulate that. We use the tactics that others use. That is a good start, but sometimes we find that those methods don’t fit us. Those methods may make things awkward for us. That is when we need to adapt and own the solution for ourselves. That is when you move from imitation to innovation. Innovate to adapt. As a pastor, I’ve tried to do things the way other pastors do them…but it doesn’t seem “me” sometimes. I have been working on doing things the way God wants me to do them. That can be a struggle, because that takes time to discern and pray about how God wants me to move forward. But I take what others do (imitation) and adapt to my style (innovate). I hope you and I have the courage to trust in the Lord today to take action in the same way that David took action…that we might trust in the Lord and know we are equipped and gifted with tools for serving the Lord and our neighbor. 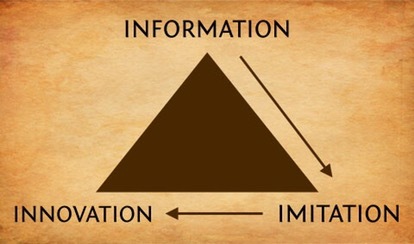 We move from information to imitation to innovation. What have you learned from others and adapted over the years??? P (Prayer): Lord, remind us that you don’t just call the equipped…you equip the called. Help us to discern your call. Amen. This entry was posted in 3DM, Digging Daily, Growing Leaders and tagged David, Imitation, Information, Innovation, Lead. Bookmark the permalink.